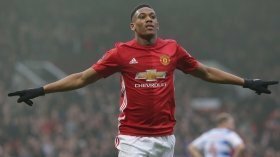 Manchester United have reportedly reached a verbal agreement with winger Anthony Martial regarding a new long-term contract with the club. The 23-year-old has been in a contract standoff with United over the past year but he has recently changed his stance after becoming a regular figure under caretaker boss Ole Gunnar Solskjaer. According to RMC Sport, the Red Devils have been holding negotiations with the Frenchman for the past few weeks and they have eventually convinced the attacker to sign the extension. It is added that the deal could be announced before the end of the week and the attacker stands to receive wages around £120,000-a-week on a five-year contract. Aside from Martial, United are also in discussions with Ander Herrera, Juan Mata and David de Gea regarding possible extensions and the Spanish trio could commit their futures in the forthcoming months. Manchester United are currently sixth in the league standings with 45 points, two behind the top-four positions. They dropped points for the first time under Ole on Tuesday night where they drew 2-2 against Burnley.